Our ground floor, Island style condo is steps away from the pool, Jacuzzi and BBQ area. This unit is 2 bedroom, 2 bath. The bedrooms have comfortable Queen size beds. The condo has been completely updated and includes new full size washer and dryer. There even is small extra refrigerator just for keeping your beverages cold. Our condo is furnished with all the amenities that you would expect to find in a home and not a rental. The kitchen is fully equipped. All utensils, dishes and small appliances are new. We also have a new 50 inch Samsung smart TV ( with cable TV )and BluRay DVD player. The condo also has complementary high-speed Internet access for your iPads, laptops etc. and the phone has free unlimited US and Canadian calls. Unit has an air conditioner in the main living area and ceiling fans in each room. We provide 4 Tommy Bahama beach chairs and an umbrella for your use, along with 4 beach towels and a cooler. Pacific Shores is a small condo complex with well maintained grounds. Our maintenance crew here take pride in their work and it shows. The pool area is meticulously cleaned and the grounds are well manicured. In addition to the beaches being close there are a lot of restaurants, bars, shops and grocery stores within walking distance. 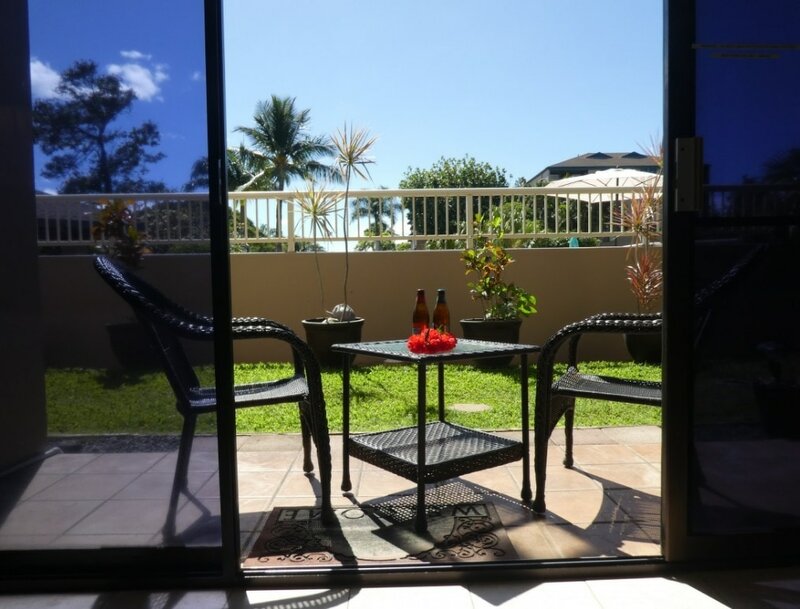 Our Pacific Shores complex is a short walk (less then 5 mins) to Charley Young Beach and Kamaole Beach I. The beautiful white sandy beach across from the property is popular for swimming, body boarding, standup paddle boarding, kayaking and just relaxing. A short distance away is a popular place called The Cove where people go to surf and to Paddleboard surf. You can even rent and/or take a lesson. For a really great experience try The Big Kahuna surf shop. They will even take video of you surfing. Family owned business' great people.